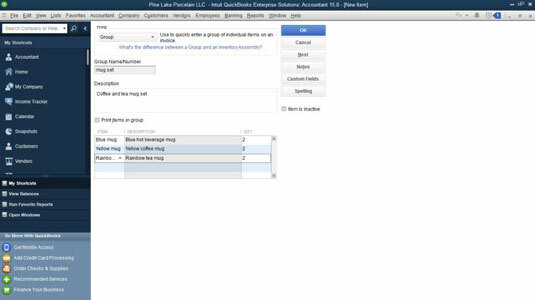 In addition to adding payroll items in QuickBooks 2015, you can create a Subtotal item to calculate the subtotal of the items you list on an invoice. (You usually need this subtotal when you want to calculate sales tax on the invoice’s items.) You might want to create other wacky items for your invoices as well, such as discounts. You need to add a Subtotal item if you ever want to apply a discount to a series of items on an invoice. To add a Subtotal item to your Item list, choose Lists→Item List, click the Item button, and select New from the drop-down list. This action displays the New Item window. Specify the item type as Subtotal and then provide an item name (such as Subtotal). When you want to subtotal items on an invoice, all you do is stick this Subtotal item on the invoice after the items you want to subtotal. Keep in mind, though, that QuickBooks doesn’t set up a subtotal feature automatically. You have to add a Subtotal item; otherwise, you can apply a Discount item that you create only to the single item that immediately precedes the discount. A Discount item, by the way, calculates a discount on an invoice. You can create an item that puts one line on an invoice that’s actually a combination of several other items. To add a Group item, display the New Item window and specify the item type as Group. QuickBooks displays the New Item window. For example, if you sell three items — say, blue mugs, yellow mugs, and red mugs — but sometimes sell the items together in a set, you can create an item that groups the three items. Note that when you create a group, you continue to track the group member inventories individually and don’t track the inventory of the group as a new item. In the New Item window, use the Item/Description/Qty list box to list each item included in the group. When you click an item line in the Item/Description/Qty list box, QuickBooks places a down arrow at the right end of the Item column. Click this arrow to open a drop-down list of items. You can create an item that calculates a discount and sticks the discount on an invoice as another line item. To add a Discount item to the list, display the New Item window, specify the item type as Discount, and provide an item name or number and a description. Use the Amount or % text box to specify how the discount is calculated. If the discount is a set amount (such as $50.00), type the amount. If the discount is calculated as a percentage, enter the percentage, including the percent symbol. Use the Account drop-down list to specify the expense account that you want to use to track the cost of the discounts you offer. Use the Tax Code drop-down list to specify whether the discount gets calculated before or after any sales taxes are calculated. You probably want to check with your local sales tax revenue agency to determine whether sales tax should be calculated before or after the discount. 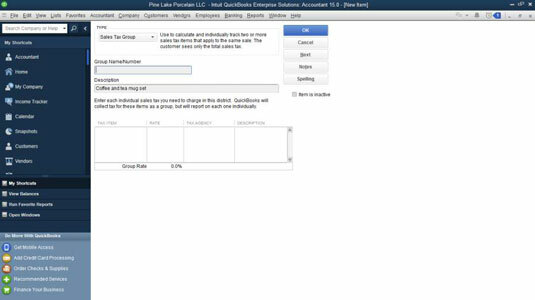 When QuickBooks displays the New Item dialog box (not shown) enter a name for the sales tax into the Sales Tax Name box, the sales tax rate into the Tax Rate box, and the state agency you remit the sales tax to in the Tax Agency box. Click OK twice after you’ve done this to close the New Item dialog box and the Preferences dialog box. Sales Tax Groups enable you to batch several sales taxes that you’re supposed to charge as one tax so that they appear as a single sales tax on the invoice. Combining the taxes is necessary — or at least possible — when you’re supposed to charge, say, a 6.5 percent state sales tax, a 1.7 percent county sales tax, and a 0.4 percent city sales tax, but you want to show one all-encompassing 8.6 percent sales tax on the invoice. To add a Sales Tax Group item, display the New Item window and then specify the item type as Sales Tax Group. 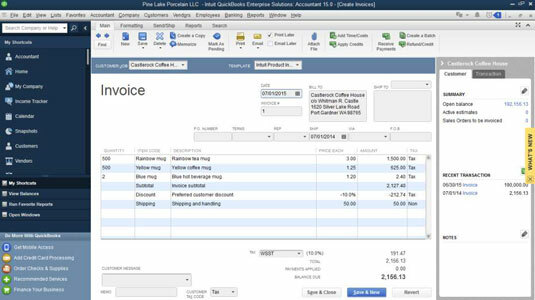 QuickBooks displays the New Item window. Use the Tax Item/Rate/Tax Agency/Description list box to list the other sales tax items that you want to include in the group. When you click an item line in the list box, QuickBooks places a down arrow at the right end of the Tax Item column. You can click this arrow to open a drop-down list of Sales Tax items.